Thank you, Sadami. We are holding all the memories real close. A mix of sad and happy tears. Hi, Pam. I'm a subscriber, but I'm not sure I've commented before. This post really touched me this morning. I love how you memorialized your Dudley, and I love all his nicknames along the border. We've said goodbye to four of our shelties over the years. I wish I'd begun sketchbook journaling years ago, so I could have honored their sweet lives as you have your Dudley's here. We still have two dogs with us, though, so I thank you for the gentle reminder to be mindful of all their gifts. Thank you for sharing Dudley with us today. I'm sorry for your loss. Thank you, Susan! In the heat of frustration and worry as Dudley's life began to go down hill it really helped me to look closer and see the silver lining that was always there. A caregivers role can be challenging - be it for humans or animals. Our Dudley helped me through it all. I'm sorry for all your losses. We love our fur friends hard and as long as we can. Thank goodness we can keep opening up our hearts to let more in! I'm so sorry for your loss, Pam. I too have said very emotional goodbyes to beloved, aged fur-pals so I feel your pain. 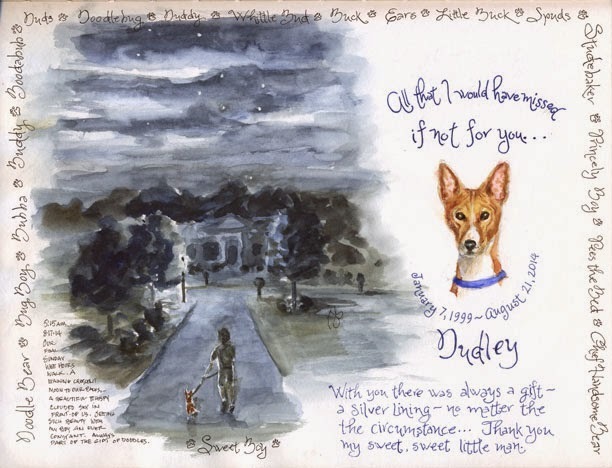 Dudley will now be remembered with love in your heart and in your journals. Thank you Serena. Always so hard to let go isn't it? I am new here, just found your blog. I am sorry about your loss. Our furry friends have such a special place in our hearts. Welcome, Janet! Thank you for your condolences. We are missing our sweet boy. I hope you enjoy the lowcountry through my eyes. What a beautiful 'Good By' for your Dudley. Thank you, Elva. Still missing that boy. I'm so sorry to hear about your loss. Losing a pet is like losing a part of the family. What a special way to grieve... art can be such a healing outlet.